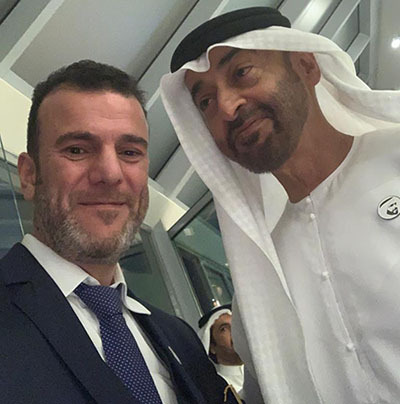 INWEX Owner Dr. Tajeddine Seif meets with His Highness Sheikh Mohamed Bin Zayed Al Nahyan, Crown Prince of Abu Dhabi and Deputy Supreme Commander of the UAE Armed Forces. His Highness Sheikh Mohamed Bin Zayed Al Nahyan is the son of the late Sheikh Zayed Bin Sultan Al Nahyan, 'Father of the Nation' and the first President of the UAE, and the brother of His Highness Sheikh Khalifa Bin Zayed Al Nahyan, President of the UAE. INWEX Owner Dr. Tajeddine Seif meets with His Highness Prince Al Waleed Bin Talal a Saudi businessman, investor, philanthropist, and a member of the Saudi royal family. He was listed on Time magazine's Time 100, an annual list of the hundred most influential people in the world, in 2008. Al-Waleed is a grandson of Ibn Saud, the first Saudi king, a half-nephew of all Saudi kings since, and a grandson of Riad Al Solh (Lebanon's first prime minister). 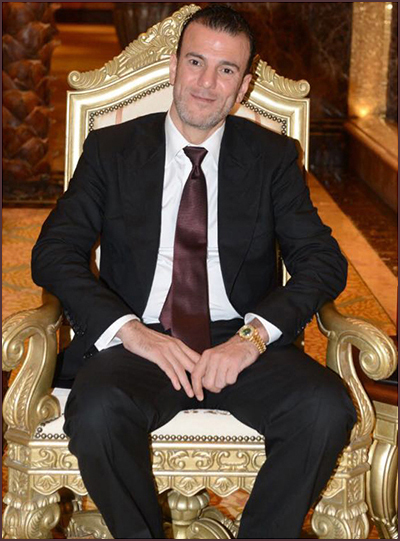 He is the founder, chief executive officer and 95 percent owner of the Kingdom Holding Company, a Forbes Global 2000 company with investments in companies in the financial services, tourism and hospitality, mass media, entertainment, retail, agriculture, petrochemicals, aviation, technology and real-estate sectors. THE LEBANESE BUSINESSMAN DR. TAJEDDINE SEIF, RESIDENT IN THE UNITED ARAB EMIRATES VISITED THE VATICAN ACCOMPANIED WITH HIS FAMILY, WHERE HE WAS WELCOMED BY POPE FRANCIS AND THANKED HIM FOR SPONSORING THE ANNUAL CHRISTMAS CELEBRATIONS HELD IN THE VATICAN. Pope Francis warmly welcomed his visitor, who presented a souvenir that embodies the close relations between the state of United Arab Emirates and the Vatican; it is a golden figure of the Grand Mosque of Sheikh Zayed and the Cathedral of St. Peter. Dr. Tajeddine Seif participated in the meeting with a group of artists who participated in the annual Christmas celebrations "Concerto di Natale" in Pope Paul VI's Vatican Hall, and Pope Francis delivered a speech in which he stressed the importance of helping children in need, especially in the field of education. It is worth mentioning that the proceeds of the ceremony will be allocated for two projects with regard to the establishment of two schools in Uganda and one in the Kurdistan region in Iraq, specifically in the city of Erbil. Dr. Tajeddine Seif was at the head of the guests in the concert hall, especially that one of his companies sponsored this charitable art activity. Pope Paul VI was filled with a crowd of more than 6,000, including number of sons and daughters of the UAE community, headed by the UAE ambassador in Rome H.E. Saqr Al Raisi and Kuwaiti Ambassador Ahmed Al Sabah. The Italian press praised the success of the concert and the interaction of the audience with the leading artists, including Emirati singer Hussein Al Jasmi, who had a distinguished participation as the first Arab artist to participate in the annual Christmas celebrations in the Vatican. The fifth channel of the Mediaset Group will broadcast the entire concert on Christmas Eve. On the margin of these activities, Dr. Tajeddine Seif held a series of meetings with Pope Francis assistants, especially in the field of education in preparation for the future cooperation that will be crystallized in the forthcoming period before the Pope's visit to Abu Dhabi, the capital of the United Arab Emirates. البابا فرانسيس رحب بحرارة بزائره الذي قدم له هدية تذكارية تجسد العلاقات الوطيدة بين دولة الامارات وحاضرة الفاتيكان، وهي عبارة عن مجسم ذهبي لمسجد الشيخ زايد الكبير وكاتدرائية القديس بطرس. سيف شارك في اللقاء الذي عقده البابا مع مجموعة الفنانين العالمين الذين شاركوا في الحفل الميلاد السنوي “Concerto di Natale” في قاعة البابا بولس السادس في الفاتيكان، والقى البابا فرنسيس كلمة شدد فيها على اهمية مساعدة الاطفال المحتاجين خاصة في مجال التربية والتعليم. يذكر ان ريع الحفل سيعود إلى مشروعين لاقامة مدرستين واحدة في اوغندا وأخرى في اقليم كردستان العراق وتحديدا في مدينة أربيل. الصحافة الايطالية اشادت بنجاح الحفل وبتفاعل الجمهور مع كبار الفنانين العالمين بينهم المغني الاماراتي حسين الجسمي، الذي كانت له مشاركة متميزة كاول فنان عربي يشارك احتفالات الميلاد السنوية في الفاتيكان . وستقوم القناة الخامسة التابعة لمجموعة ميدياست ببث الحفل كاملا ليلة الميلاد المجيد. وعلى هامش هذه النشاطات، اجرى سيف مجموعة من الاجتماعات مع مساعدي البابا فرنسيس خاصة في مجال التربية والتعليم، تمهيدا لتعاون مستقبلي سيتبلور في الفترة القادمة، قبيل بدء زيارة البابا في أبوظبي، عاصمة الامارات العربية المتحدة. Dr. Tajeddine Seif, The Owner of INWEX Innovation Center FZE UAE (Innovation Center Dubai), is Participating in the Press Conference as an Official Sponsor of The Concerto di Natale in Vaticano. INWEX INNOVATION CENTER has established itself as responsible and reliable company. Activities of company INWEX is a world class smart innovation center that provides smart solutions, legal support, innovative tools in addition to the productively designed work space with great IRR which helps generation Y innovate and lead in their industry. Trading House INWEX has presence in Dubai, Moscow, Belarus, Italy, Switzerland and France and we have partnership with all leading banks locally and globally. The future goal for Trading House " INWEX INNOVATION CENTER " is to open representative offices in Latin America, Europe and United States of America. Trading House will expand to these markets in order to help international wholesalers find their best profitable solution. Our company is working with almost all financial and industrial groups and retail chains from Europe, Central Asia, Middle East, Africa and Russia. Nowadays we are showing great interest in trading of materials, building construction materials, food beverage, development of infrastructure projects and new IT technology development. We are welcoming all type of businesses and we are greeting all type of business proposals from different sectors and countries. As our team consists from experts and professionals from different fields with many years of experience in business on international level. We always guarantee our customers the high quality of work, fair value and timeliness of projects commissioning. Our mission is creating a productive work spaces for our partners in order for them to serve their customers better and have an edge over their competitors using our unique smart services and support. We are based in JAFZA and in the near future will be located in more than 10 free zones in UAE and around the world. No doubt that our world is an international city, everyone is connected and everything is connected, our vision is to create international connected smart offices to your business around the world.